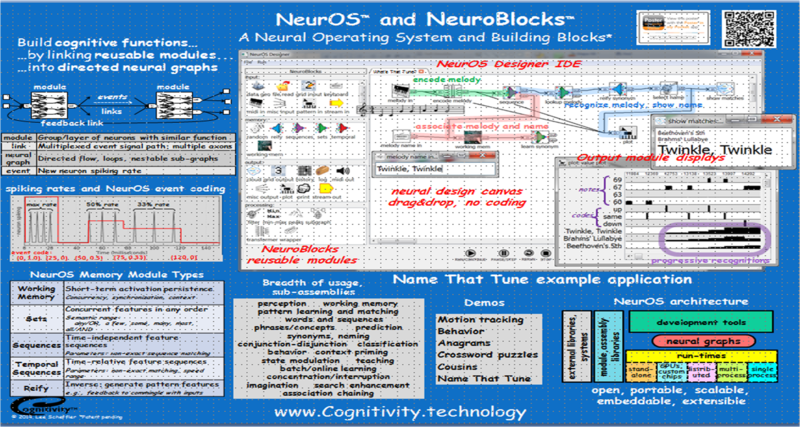 NeurOS is a neural operating system and visual neural/cognitive programming language. It supports a neural computing paradigm, a non-von Neumann, non-procedural, parallel data flow style of computation similar to the way biological brains operate. Signals flow in parallel through a neural graph of reusable NeuroBlock modules managing groups of neural functional elements. This models the ebb and flow and recombinatoric concurrent computation processing style of biological brains. Memory is distributed among modules and learning can be continuous. A technical paper introducing NeurOS and NeuroBlocks was presented at the 2014 Biologically Inspired Cognitive Architectures (BICA) Conference and published in BICA Journal. The demonstration videos show a variety of usage patterns and prototype applications built with NeurOS. A NeurOS development kit is expected to be available in the near future. Join the NeurOS interest community to be notified when the NeurOS technical paper, the development kit and additional demonstrations and prototypes become available, and to track advances in the technology.